Christopher Nolan’s latest choice of project surprised many – Dunkirk follows the events of Operation Dynamo in which hundreds of thousands of Allied soldiers were almost miraculously evacuated from the town in northern France. At first it seems quite an about-turn for the director but he found very much his own way of doing it. As has become customary with Nolan films, various instructions have been issued to cinemas brave enough to want to show the film – projectionists must prove they are of pure birth, only people who can prove they have recently emptied their bladders and bowels are allowed in, that sort of thing – but the reaction from those who have managed to see it has been overwhelmingly positive. 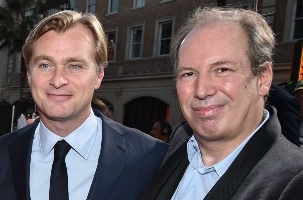 Nolan is the most significant directorial collaborator of composer Hans Zimmer in the 21st century. The five scores so far have all been controversial to some degree or other, but while I’m not a great fan of the ones for the Batman trilogy, the other two – Inception and Interstellar – are arguably the two finest pieces of work Zimmer’s ever done. Whatever debate may have surrounded those, it’s nothing compared with the completely polarised response to Dunkirk. Jerry Goldsmith used to say that the first rule of being a good film composer was to be a good composer. This score proves that actually the dividing line between what could be considered music and what is more like sound design is a thin one and what will I’m sure go down ultimately as a very successful film score can actually be much more like the latter than it is the former: its use in the film is not without controversy itself (some commentators feel the film may have been even more powerful without it, which leads me to suspect they don’t know what they’re talking about) but most agree that the score is an absolutely pivotal part of Nolan’s jigsaw, contributing to the raw, visceral feeling that pervades all. If the previous Nolan/Zimmer score, Interstellar, was ultimately about emotion (and despite all the manufactured hype about the use of an organ, as if it were the first film score ever to do so, it was about emotion) then this one is – by the director’s own admission – about precisely the opposite. He says he wanted the composer to eschew emotion, to avoid sentiment and so on, and focus instead exclusively on building tension, and while that isn’t entirely true for reasons I’ll come on to, that is ultimately what much of the score does. Years ago, when Zimmer wrote Black Hawk Down for Ridley Scott, his score was a musical representation of the chaos of war. I said at the time that I thought it was a brilliant creation and the years haven’t dampened its impact; and Dunkirk could be considered in some ways a more extreme follow-up to that. But I’m not sure it is necessarily more extreme: instead it is quite possible that in Black Hawk Down Zimmer was focusing on the internal chaos within the characters as much as the external chaos with which they found themselves surrounded; this time round I think he has gone entirely for the external, I think actually trying to provide something which approximates the almost unbearable sounds which would have faced the soldiers at the time. The use of a ticking clock has been much-discussed – it may be a somewhat hackneyed device now, but it’s still effective. Less-discussed are the various other effects: in the opening cue “The Mole” we hear what sounds a bit like a siren repeating, and that effect persists for much of what follows; stereo effects seem to simulate shell shock; there are times where the ticking clock is more like a heartbeat; there are confused whispering synth effects; and so on. It’s fascinating and tremendously effective. I have little doubt that it will go down as a seminal work in the Zimmer cannon and if the film’s a great success it may go on to be considered as one of his finest achievements by mainstream film critics: the only real question is whether something that is so ingrained to be part of the overall immersive experience of the film can be extracted from it and enjoyed on its own terms. My feeling is that it can’t: regardless of its virtues as a film score, as an hour-long soundtrack album it just doesn’t function. That’s not Zimmer’s fault, not anyone’s fault – it’s just that this is on the “wrong” side of that dividing line between music and sound design to be satisfying to someone looking at it from a purely musical perspective, which is what I’m doing here. I suspect it will end up being up for a lot of “best music” awards when the film award season kicks in, but I doubt many soundtrack album reviewers like me will give it the higher marks when it comes to ranking albums. I’ve been reviewing soundtrack albums for over two decades. Every time, after writing the words, I’ve come up with a star rating. For the first time ever, I seriously considered refraining from doing so, this time. Contrary to a lot of negative reactions I’ve read from others, I think it’s a brilliant achievement by Zimmer, a perfect execution of the vision Nolan had. As an album, it’s a particularly raw experience, quite unlike any I’ve experienced before – ironic, given the number of previous Zimmer scores that have been hailed beforehand as being unlike anything that’s been heard before, this one may actually be worthy of the tag. I have little to offer but praise for the way it’s been done. Trouble is, so successful is it at offering a sonic impression of a place and circumstance the horror of which is far beyond what someone like me, a privileged 21st century westerner, can even comprehend – I very much doubt that after writing these words I will ever want to listen to it again. Agreed. I’m not a fan of the score in album format, but I can’t deny the effectiveness of it IN the movie. Usually, there’s always something interesting to be had in a Zimmer album. This is a the first album that left me cold. The most obtrusive, overbearing, monotonous, headache-inducing “musical” experience of my film-going life. I literally had to restrain myself from booing Zimmer’s name when it appeared in the end credits. If this is what Nolan wanted, shame on Nolan. I agree completely. I have just seen the film and almost left because of the dreadful sound track. It does not support the film at all and I thought the composer’s treatment of Nimrod was appalling. James, did you watch the movie? The score is noisy and awful. Nolan is so afraid of not having “music” that the effect is to not feature a silence in the whole motion! One of the worst film scores ever, and it is getting kudos from film reviewers! Terrible experience! It makes no sense whatsoever that a director would want to eschew emotion. The sole purpose for making a film is to arouse emotion from the audience! I never heard anyone saying ‘my favorite film is …. because it I felt no emotion at all watching it over and over again’. Oh wait, there is of course another purpose for making a film…..
Making a profit! And switching on a synthesiser is much cheaper than the process of orchestrating, hiring real musicians etc etc, resulting in…… more profit! Why wouldn’t Nolan simply choose no score at all, instead of a very cheap one like this? Because any ‘score’ with Zimmer on it will sell big time resulting in more profit! No one is making significant profits off of score albums. No one. Really? Sure, the soundtrack market is niche, but no one? I wonder what the producers of the Titanic soundtrack album would have to say about that. And although I’m not planning to go see Nolan movies at all, the same goes for Zimmer scores for those as well. Applause James for not rating it, I follow my idea that as soon as a score is released as stand alone album it should be reviewed as such, regardless of the movie. you recently put morricone in the sounddesign category, am i right?! Yes, I did. Sometimes Ennio uses minimalistic, mostly electronic scores to enhance the sound design. He did it before in films like ‘Mission to Mars’ and ‘The Stendhal Syndrome’ and some tracks for Tarantino’s ‘Hateful eight’ I prefer to categorize in the same category. But that’s my personal opinion of course. The Sakamoto score for ‘The revenant’ was intended to do exactly that. I think that the score is actually better on album than in the film. It was a good idea to arrange suites for the album because in the film you can here snippets of music here and there but it has no unity at all. I was actually distracted and annoyed by the music during the film but on album – while it is not one of Zimmer’s best – it’s still has a couple of tracks that are quite good or at least interesting. However I think it would have been much better if Nolan had wanted some emotions. Which is, unfortunately, not one of his greatest sides as a director. Says everything about modern composing that when they wanted to turn to an emotive (melodic?) phrase in the music they had to raid Elgar. Good grief. At least when Horner turned to the classics for inspiration (I’m thinking of Glory here) he was able to give it a fresh phrasing and make it his own. Having seen the movie, Zimmer’s music does invoke tension that leaves one on the edge of their seat. Classically, an organ would maybe have the same effect as a synthesiser. The music is intricately part of the movie, and the movie intricately part of the music. One without the other, the formula of Dunkirk and the music doesn’t seem to work well. Overall, it was an excellent collaboration, and the movie will go down as a classic war movie. Completely agree with the sentiment here. I see praise for this soundtrack all around, but I cannot for the life of me get myself to listen to the album in its entirety without turning it off halfway through. One of the most impressive score I’ve ever heard. It’s so refreshing and exciting when a composer tries to uncover new ways of writing film music. It’s certainly not obtrusive, overbearing or monotonous as I’ve read above. It’s powerful, strong, sometimes touching and gripping. You need new ears to understand it and enjoy it. With a more common approach, Nolan’s movie wouldn’t have been half as exciting. The music is obnoxious. I would love for you to explain what type of new ears one needs to have to understand this non-sense. There is no melody, no harmony, no musical line, no motif … if by new ears you mean you need to like metal clunking sound 360 degrees, then I agree. How does this musical nightmare work in the movie? first time in my life I need to pause the movie, and lower the sound … usually the music elevates the movie, in this case, the music obliterates Nolan’s film. A shame for film music, a shame for Zimmer, and a shame that this thing got 2 stars (no stars is the only that deserves). The type of ears linked to a brain who understand that a film music may include noises, curious sounds, some a bit annoying, ok, but all for the best. Those so called obnoxious sounds create the atmosphere, the tension, far better that any melody. Think, for exemple, of that Morricone score, for a french thriller called “Peur sur la ville” (Henri Verneuil, 1975). At first, that strident gnashing looks like a streetcar derailing and it’s quite disturbing. But listen it again, and again, and it creates the right tension, the right discomfort that installs you right in the film. In Dunkirk, those moments make even greater the few melodic titles like “Variation 15” that comes after. A pure marvel, because it appears like a kind of solace after all that suffering, pain and fear. I’m absolutely sure I won’t feel that relief without what you call obnoxious music. As it should be judged as sound editing in the way Zimmer used his composition within the movie I wonder if the people that find it a marvelous SCORE mean they actually liked the movie because of the effect it creates. As musical score it has nothing to do with the art form we all love. Hence why it is not on Screensoundradio. The music is appalling – I have just finished watching the film and felt disappointed as I had hoped for so much more. Throughout there was a constant distraction from the content due to the soundtrack being so bad, the film itself is ok but only just. It will never be remembered as a classic. Some critics have raved about the film, personally I think it could have been much better. The soldiers had a lot more spirit in 1940, however they are depicted as self serving even cowardly.